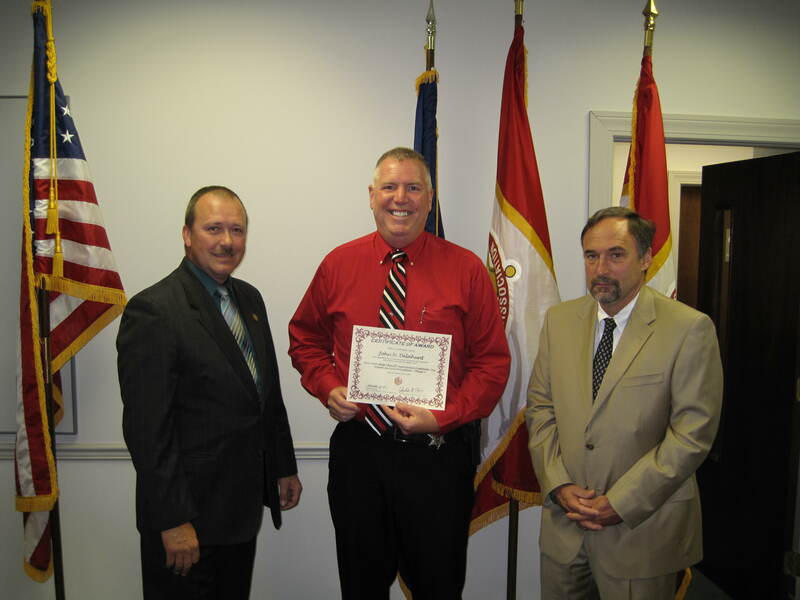 Pictured above is John Delahunt (middle), Oswego County Sheriff's Office, accepting his certificate of achievement from Sgt. Kevin Owens, (left) Ontario County Sheriffâ€™s Office and Chris Oâ€™Brien, (right), Executive Director, New York State Sheriffsâ€™ Association Institute, Inc. The New York State Sheriffs’ Association Institute recently held a week-long Basic School for deputy sheriffs and civilian staff who work in Sheriffsâ€™ civil divisions. All Sheriffs have civil law enforcement functions, which include the service of process, and enforcement of judgments and other court orders and mandates. Sheriffs must keep exact records on such items as judgment interest, fees collected for the county, and disbursements to judgment creditors, and these items were reviewed at the school. This school also covered some of the more difficult and time-consuming cases that Sheriffs face in their civil divisions, such as real property sales, and the execution of orders of attachment and order of seizure. Deputies who are experts in civil enforcement law participated as instructors for the school. Twenty-nine deputies and other staff from Sheriffsâ€™ Offices around the State attended the program. This is part of a two-week school. The school is required training for counties seeking civil office accreditation, a program provided by the New York State Sheriffsâ€™ Association. The Sheriffs’ Association Institute has provided civil law enforcement training for thirty years, and has trained over 2,000 Deputy Sheriffs and their employees. It provides the only statewide training program for civil deputies, and is provided without charge to any civil personnel nominated for the school by a Sheriff.